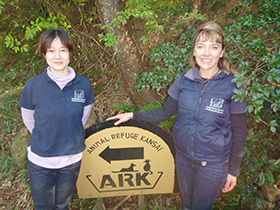 The Healing Animals Organisation has forged a wonderful working relationship with the animal charity Ark based in Japan. Every year I teach animal healing, nutrition and communication in Japan and for the last four years I have been travelling to Tokyo to offer healing to dogs, cats, horses, reptiles and tortoises. 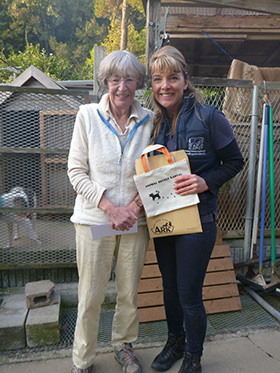 I have always been interested in ARK and their founder, Elizabeth Oliver who has recently been awarded an MBE for her services to animal welfare. I made contact with Elizabeth who was very interested in The Healing Animals Organisation and invited me to come to the sanctuary to do some work. Two years ago I ran a fundraiser in Tokyo and raised £500 for ARK and this year it topped £1000. I was eager to visit the sanctuary and Elizabeth. Ironically just four weeks prior to my trip to Ark in Japan I was with Elizabeth at the World Conference of Animal Welfare where I was a speaker. We actually met face to face for the first time, even though we have been in correspondence for some time! 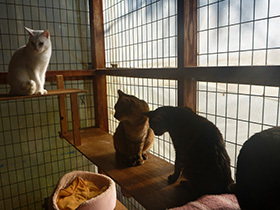 It was such an honour for Mina and I to be invited to ARK to offer relaxation techniques to the many cats and dogs, and offer them my macerated food oils which I donated to ARK. 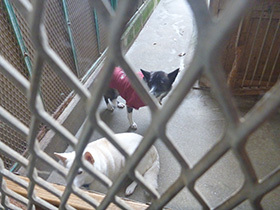 Many of the dogs we treated at ARK were involved in the Tohoku Earthquake and consequently the Tsunami that followed. A radius of twenty miles around the melted down Fukushima nuclear power plant was cordoned off. Thousands of animals perished, not of the earthquake itself but of starvation and neglect, when their owners were forcibly evacuated and they had to leave them behind. 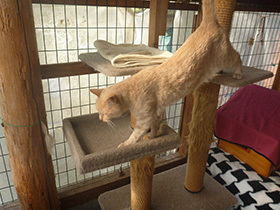 However ARK came to the rescue for those guardians who could not take their animals to the temporary accommodation the government provided for them. ARK is now housing some 200 animals that are still waiting to be repatriated with their guardians. It’s frustrating as these gorgeous dogs we were giving healing to really missed their guardians and their environment. However I was grateful that Mina and I were able to spend time healing them. Many of the dogs we spent time with self selected my nutritious Marigold oil, lapping it up from the plate and seeking more. Mina and I gave healing to many dogs and cats, and one specific dog had a terrible skin problem which the vet was happy for me to treat. I set to and took my own home made topical fresh Aloe Vera gel and lovingly applied it to Lao. I gave written instructions and a two week supply and asked the staff to email me two weeks later with an update. 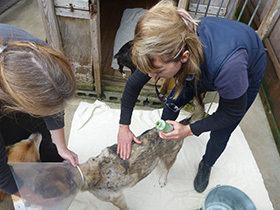 Sure enough the staff emailed me to say that Lao skin complaint had cleared up and they were amazed with the results and please could we supply more for any new rescued dogs with similar conditions. Many animals are physically and mentally abused all around the world, and Japan sees it’s fair share of terrorised dogs and cats. Mina and I spent time with a dear little dog that had lost trust with humans. Both Mina and I knew that this was going to take a lot of rehabilitation and time however in the beautiful sunlight outside we sat with our new friend and began our relaxation techniques, also showing the ARK staff some new ideas to enhance the bonds of love between animals and their carers. It was time to say goodbye, we had worked tirelessly all day and we reluctantly gathered our coats and bags. Hugged Elizabeth and staff for their amazing commitment to animal welfare and we felt very blessed we had played a small part in the rehabilitation and future re homing of these beautiful animals.